Drylands is one of New Zealand's first wineries to produce vibrant and zesty Sauvignon Blanc from New Zealand's famous Marlborough region on the South Island. 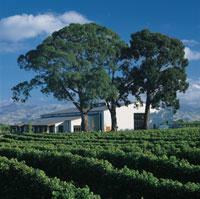 The Drylands Home Block vineyard is located in Marlborough's esteemed Golden Triangle area. It is one of Marlborough's original Sauvignon Blanc vineyards, planted on its own roots in 1980, back when the now world-renowned wine region was just developing. Revered for its vines' natural state of equilibrium, Home Block is one of only two original plantings in Marlborough that remain intact today. Darryl Woolley is one of the most seasoned and knowledgeable winemakers in New Zealand, with more than 30 years experience handcrafting wines of extraordinary character from the Home Block vineyard. In an area of Marlborough that claims the most hours of sunshine and a lower than average rainfall, the Home Block vineyard delivers small yields of excellent fruit. These high quality grapes provide Drylands wines with their distinct and sought after flavor.